Fake money reminds voters of the treasurer office. 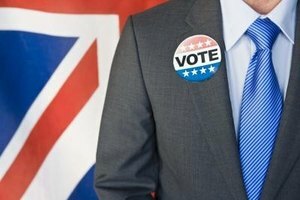 The elementary school student council is the first chance many students have to express their opinions and learn more about running for a public office. The role of treasurer is a significant one because the treasurer is responsible for handling the money the school raises and budgeting that money for special events. Election ideas for the treasurer position include creative ways to get the word out about the campaign. Look for play money from board games like Monopoly and fake money designed for children. Check with teacher supply stores for inexpensive fake money used to teach counting. Use brightly colored markers to decorate each piece of paper money, writing “Vote for X” in bold letters on both sides. Pass the fake money out to students voting in the election. Cut long rectangular shapes from light-green construction paper, making each piece the same size and shape as a dollar bill. Use darker colors of green markers to decorate each piece, making it look like a million dollar bill. Take a photograph of the candidate and have black and white copies made, getting one for each piece of paper. Cut the photograph copies into an oval shape and glue to the center of the paper. Write the candidate’s name on the top and stick a piece of double sided tape on the back. Tape at least one of the papers to every locker in the school, or the lockers in the main hallway. Make small posters that explain the reasons the candidate is running for student council treasurer. List any upcoming events or fundraisers that will bring money into the school. Explain what the money from each event will go towards and what the candidate plans to do as treasurer. Write the lists on plain sheets of white or brown craft paper and decorate the edges with stamps, stickers and other decorative elements. Hang the posters in the bathroom stalls, where students will see the signs every day. Draw an image of an old-fashioned looking cash register, with a stick figure standing beside it. Glue a picture of the candidate’s face onto the top of the stick figure. Write the campaign slogan at the bottom, such as “Voting for X Makes Cents.” Make dozens of copies of the poster and hang it around the school in common areas, including the cafeteria and gym. 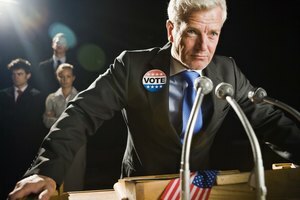 Campaign Guide: So you want to Run for Office? Eblin, Jennifer. "Election Ideas for a Elementary School Student Council Treasurer." 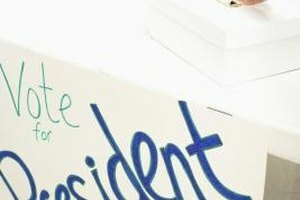 Synonym, https://classroom.synonym.com/election-school-student-council-treasurer-8607021.html. Accessed 25 April 2019.